With Spring here and Summer rapidly approaching, many of our clients are asking about seasonal discounts. So, we’re pleased to be able to unveil a special offer on anti-ageing treatments in Knightsbridge for all our female and male clients. Having seen an increase in new client business at our central London aesthetic clinic in recent weeks, we’re delighted to welcome on board three new consultant surgeons – all specialising in anti-ageing treatments. The three new surgeons at HB Health are well-established in their own right, and bring decades of experience in anti-ageing treatments, anti-wrinkle injections (Botox), filler injections and other non-surgical beauty treatments for our clients. Dr Ahmed is proving to be extremely popular, as he offers evening and weekend consultations at our central London aesthetic clinic. So, we’ve decided to promote these wonderful new cosmetic surgeons joining us in central London, with an exclusive offer on their anti-ageing treatments. 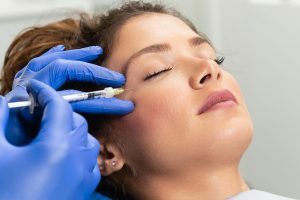 Please mention this blog post when you book in for an anti-ageing treatment with Dr Steven, Dr Ahmed or Dr Najia to get a full face anti-wrinkle injection (Botox) treatment for only £199 covering two areas or £250 covering three areas. Many of our clients see immediate and huge benefits from our anti-ageing treatments, and these are available to both male and female clients. To find out more about our range of anti-ageing treatments, anti-wrinkle injection (Botox) treatments, facial treatments and skin treatments, please visit here. As experts in anti-ageing, the team at HB Health are dedicated to providing the very best anti-ageing treatments in central London for all our clients. HB Health of Knightsbridge has an enviable reputation in the field of anti-ageing, with CEO Heather Bird being the Founder of the prestigious annual Anti-Ageing Conference London event. To find out more about this world-renowned industry event, please visit here. 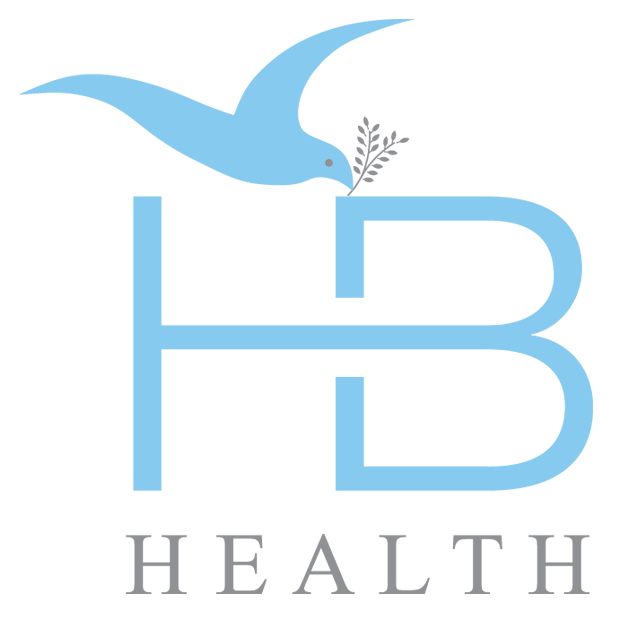 To see the full range of anti-ageing treatments we offer in central London, please get in touch here. To find out more about our three Consultant Surgeons, please visit here to meet them and the full team at HB Health of Knightsbridge. The team at HB Health are really excited to announce that Oxyjet glow treatments are now available at our Knightsbridge aesthetic clinic for our lovely clients. 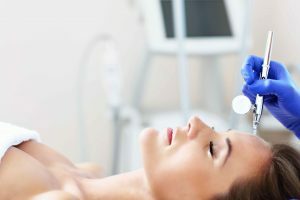 A hit with celebrities in recent weeks such as Sadie Frost, Elle Macpherson, Katy hill, Laila Rouass and Davinia Taylor, oxygen facial treatments are one of the most popular face treatments to be see in the UK in 2018. Here at HB Health of Knightsbridge our resident hair and beauty guru Janet Ginnings has devised a new specialised facial treatment – the Oxyjet. Our unique Oxyjet glow treatments in central London are a new oxygenation treatment using a combination of exfoliation, oxygen and vitamins to regenerate hylonic acid which is very similar to our natural collagen, the skin, and improve circulation. The new Oxyjet glow treatments are also ideally suited to help treat scar tissue, lessen visible wrinkles, and reduce certain skin pigmentation problems. The face and declollete are cleansed with Oxyjet products, then exfoliation of the upper epidermis. Anti-free radical A,C,D and E vitamins and hylonic acid are pushed into the skin by our unique Oxyjet pressure system, which penetrates the basal layer to regenerate the cells. Oxyjet fluid is then sprayed onto the skin to improve blood circulation. A collagen face mask with calcium B5 is applied to cool and calm the skin, then an aroma oxygen mask is put on to improve metabolic performance. An additional stage can be added by treating eyes with our Instant Caviar Lift Beauty Tox Patches. These specialised caviar-collagen patches immediately minimize the appearance of puffiness and wrinkles around the eyes and mouth. Oxyjet treatments last for approximately 75 minutes and will give clients smoother, firmer, younger-looking skin with a refreshed glow for months. We recommend a course of weekly treatments for five weeks to see the best results, but a difference will be visible after the first Oxyjet treatment with us. Please mention this blog when you book in for an Oxyjet treatment to get an exclusive 25% discount on your first treatment with us in Knightsbridge, too. To see the full range of facial treatments we offer in central London, please get in touch here. With Spring upon us, many clients are asking about the best body treatments to get ready for Summer in Knightsbridge, and our team of therapists and doctors are on hand to provide a leading range of services to help. The beauty and health regimes many of our clients utilise every day also depend on advance assistance and body treatments to help provide the perfect Summer-ready look. All clients are different, and at our Knightsbridge aesthetic clinic we offer individual and bespoke advice, treatments and wellbeing programmes. That being said, we have certain body treatments that are popular with a majority of clients looking to get themselves looking amazing for Summer. The main priorities for clients when it comes to getting themselves ready for Summer usually includes hair removal, slimming and skin rejuvenation. Instead of shaving, tweezing and waxing, laser hair removal is one of the most popular forms of hair removal currently available at our London clinic. We offer the latest technology in laser hair removal with our Soprano Ice Platinum system that delivers a dramatic reduction of unwanted hair. Lasers are useful for removing unwanted hair from the face, arms, underarms and bikini line, with no downtime and no discomfort following this treatment. To find out more about our Soprano Laser Hair Removal body treatment, please visit here. Unlike liposuction, this body treatment for fat freezing is non-invasive, needs no surgery, and is a permanent fat-reducing treatment for the body. The Cool Tech technology we utilise at our central London aesthetic clinic works by a process of cryolipolysis whereby fat cells are frozen under control. Results from this body treatment are noticeable after just one session, and the effects of Cool Tech are clinically-proven from over 1,000,000 treatments. To find out more about our Cool Tech Fat Freezing body treatments, please visit here. This newly-launched body treatment is non-invasive and provides an all-in-one pain-free service for fat reduction, body contouring and cellulite reduction. This unique body treatment involves micro-spheres that break down, remove and re-shape fat and adipose tissues, whilst stimulating collagen production. Clients using our new and exclusive Endosphere body treatment have noted firmer, tighter skin with fat break-up, drainage of skin tissues and fresher skin. To find out more about our Endosphere body treatment, please visit here. HIFU stands for High Intensity Focused Ultrasound, and is a clinically-proven anti-ageing body contouring service for men and women using ultrasound. HIFU body treatments work by stimulating the production of collagen for a natural and younger-looking appearance for clients body and facial skin. Completely, non-invasive, HIFU treatments at our central London aesthetic clinic produces a light prickling feeling, with the service lasting 45 minutes. To find out more about our unique HIFU Body Contouring treatment, please visit here. We offer a range of packages for body and facial treatments, ensuring that clients receive big savings on related services. Ask in-clinic for details. To see the full range of body treatments we offer in central London, please get in touch here. What are the top facial treatments for Spring in central London? It’s that time of year when many of our clients are asking what are the top facial treatments for Spring in central London. We offer a range of fast and effective facial treatments at our Knightsbridge aesthetic clinic, and clients love the results they see being delivered. Spring is also a time of year when many clients are looking to get fresh, bright, rejuvenated facial skin after the rigours of harsh Winter weather. This hugely-popular facial treatment delivers visible effects with noticeable improvements in facial contouring, with reduction of wrinkles and fine lines. HIFU treatments can target specific areas of the face such as brow, jowl and neck lifting and helps to stimulate natural collagen production immediately. There are no cuts to the skin, no recovery time is needed, and the facial skin is immediately given a fresh, youthful glow ready for Spring months ahead. To find out more about our popular HIFU facial treatments, please visit here. We offer a range of Skin Peel facial treatments at our Knightsbridge clinic, with the main aim of unifying pores, reducing oil production and improving the texture of facial skin. A full consultation is conducted before any Skin Peel, to determine the skin type and then offer the best possible Skin Peel facial treatment to provide. Lasting on average for 45 minutes, our Skin Peel treatments are all delivered with a relaxing application of mask and serums, with no downtime afterwards. To find out more about our range of Skin Peel treatments, please visit here. We also provide a leading number of face treatments, including advanced skin treatments, skin lifting and skin tightening procedures, skin rejuvenation and micropigmentation services – please visit here to find out more. We offer packages for combinations of facial and body treatments, giving clients significant savings on our full range of London aesthetic treatments. To find out more about the facial treatments we offer in central London, please get in touch here. HB Health are excited and pleased to announce the launch of new CBD oil products at our Knightsbridge clinic for clients old and new to enjoy. The HB Health-branded range of exclusive CBD oil products are now available, making us the first CBD Wellness Clinic in central London. These new CBD GM-free oil products are suitable for young and old, and can improve general wellbeing as well as treating some beauty or skin conditions. The CBD is grown in Colorado and Europe, strictly to a non-psychoactive blend, with low (or no) THC present, and extracted from Industrial Hemp. The exclusive HB Health CBD oil range of products have been triple-filtered to meet the highest ‘Golden CBD’ standard, to provide maximum benefit. This exclusive Face and Body exfoliating product comes in a 150ml pot, containing 20ml of Gold Standard Cannabinoids. It is designed to provide a superior level of skin exfoliation, as well as soothing tired skin pores as a pre-treatment for our other HB-branded CBD oil products. This new facial twin-pack product comes in a 150ml size, and contains 20mg of CBD with 10mg in each face mask. It contains European Gold standard cannabinoid oil, with essential oils of Wild Orange and Bergamot. This CBD Skin Cream & Moisturiser is the best organic and GM-free CBD oil available, blended with organic GM-free essential oils to produce an amazing result to the skin. Each 50ml pot contains 200mg of CBD. This new Muscle Massage CBD product comes in a 30ml bottle spray and contains 200mg CBD. It also contains natural herbs, hemp oil and essence of camomile, to provide a relaxing and rejuvenating experience for muscles. Following application of these products, clients can enjoy a Hyperbaric Oxygen Chamber with a CBD Diffuser being activated during the treatment. These new CBD oil products can be purchased individually as required, and we offer a specialist expert consultation on how to improve and enhance wellbeing through the use of CBD oil-based products from our London clinic. 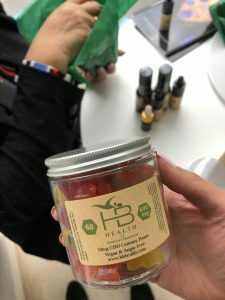 Clients can also enjoy a CBD coffee whilst visiting the clinic, as well as signing up for exclusive delivery to their door of our associated HB-branded CBD oil products and HB CBD Vegan & Sugar-Free Gummy Bears. 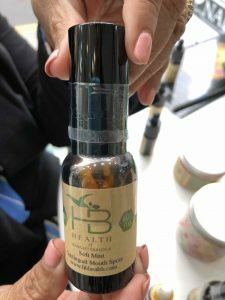 Other CBD oil products have also been specially-developed under the new HB Health CBD range, including CBD Mouth Spray, Vegan CBD in Avocado Oil and CBD Deep Muscle Relief Spray. These additional oils also come in strengths ranging up to 40% CBD, ensuring that our clients receive the maximum benefit from our new CBD oil products. Celebrity clients using the new range of HB CBD products have already been hugely positive about the benefits of these superb new body treatments. To find out more about the full range of new and exclusive CDB oil products we offer at our Knightsbridge clinic, please get in touch here. 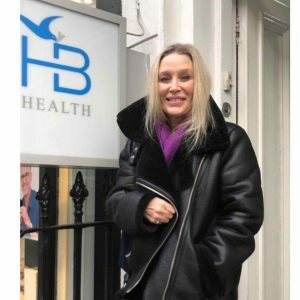 The new HIFU non-surgical facelift treatment at Knightsbridge beauty clinic HB Health has been officially endorsed by beauty guru Angie Best this week. HIFU stands for High Intensity Focused Ultrasound, and is a clinically-proven anti-ageing facial treatment for men and women which utilises ultrasound technology for lifting and tightening the face and neck areas. HIFU treatment works by stimulating the production of collagen for a natural, younger-looking appearance. HIFU treatment lasts between 30-45 minutes. As the HIFU ultrasound waves are focused around the facial treatment areas, tiny amounts of energy are transmitted to precise depths beneath the skin. This tiny prickling feeling indicates that the collagen-building process is taking place, and the sensation lasts fort a short while. It is completely non-invasive. Most clients utilising this new HIFU anti-ageing facelift treatment at our Knightsbridge beauty clinic have reported immediate effects from the treatment. Results can take up to 12 weeks to highlight, but they will continue to improve for around seven months post-treatment. We are also offering an amazing discount – any client mentioning this Blog post when booking a HIFU anti-ageing non-surgical facelift treatment with us will get a 50% on a full face and neck treatment, at the reduced price of £750. To find out more about our incredible HIFU non-surgical facelift treatments in Knightsbridge, please visit here. To read more about model and health guru Angie Best, please visit here. Leading London aesthetic clinic HB Health of Knightsbridge are delighted to now offer new Endosphere treatment from Italy for clients – and we have an amazing offer to celebrate the launch of this incredible body treatment. Endosphere is a non-invasive body treatment which helps to provide an all-in-one pain-free treatment for fat reduction, body contouring and cellulite reduction, and has been hailed the hottest beauty treatment for 2019 so far. Having brought Endosphere from Italy to our leading Knightsbridge beauty clinic, it can also be used on the face to reduce wrinkles and contour skin. This unique body treatment involves micro-spheres that break down, remove and re-shape fat and adipose tissues, whilst at the same time stimulating elastin and collagen production for a more toned, sculpted and uplifted effect. These results have previously only been possible by using more aggressive, invasive body treatments, making Endosphere a faster and painless option. The new Endosphere treatment works on the skin using a cylinder attached to a joystick of 55 rotating spheres. The variation of the cylinders’ speed determines the frequency, whilst the rotation and pressure have a pump effect on skin tissues, which is variable and different according to each patient. Endosphere is an effective body treatment that breaks up fat, drains skin tissues, improves skin breathing capacity, and increases skin temperature. The synergic action of Endosphere treatment have been proven to assist pain relief, body contouring, lympathic drainage, and muscle toning in one simple non-invasive body treatment. Clients using this body treatment in Italy have noted tighter, firmer, uplifted skin in less than a few courses of Endosphere treatment. The Endosphere treatment was officially launched last week at HB Health of Knightsbridge in front of a host of beauty influencers, beauty bloggers, media representatives, and even royalty including Princess Von Furstenburg and Princess Constanza Della Torra at our 12 Beauchamp Place HQ. Any clients mentioning this Blog post when booking an Endosphere treatment at our London beauty clinic will get a 20% discount on their first course. To find out more about how the amazing new Endosphere treatment works, please visit here. What a week we have had at HB Health Knightsbridge, straight after my winter break to America with the kids for the seasonal holidays. Have you been searching for an all-natural, ‘miracle’ cosmetic treatment that would help to turn your ‘aging’ clock back? What if I were to tell you it exists and is the current cutting edge latest medical advance in skin and hair rejuvenation? What if the magic ingredient was already inside your body as you read these very words! Well it is, and it is called PRF- treatment. (Platelet Rich Fibrin). Instead of shaving, waxing and tweezing , laser hair removal is fast becoming the number one form of hair removal around the globe, and after my experience with it, I can see why!.